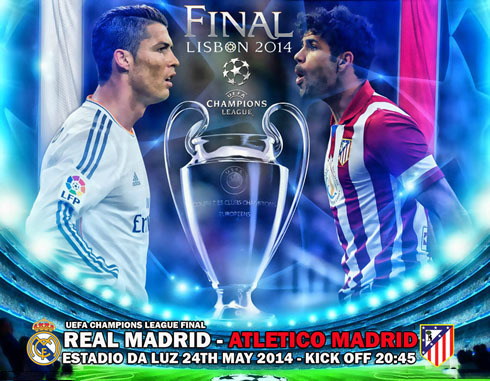 ﻿ Champions League Final preview: It's anybody's game! 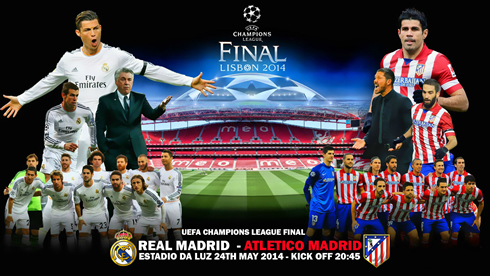 23.05.2014 » Champions League Final preview: It's anybody's game! La Liga might have concluded, but there’s still one last exciting bout to come this season from two of its biggest teams. On Saturday, May 24th, Real Madrid will face their cross-town rivals Atletico Madrid, in what will be the first ever local derby in a Champions League final. Both teams have suffered setbacks in recent weeks, in the form of injured players. Which of these two teams will be able to overcome their adversity and claim the hard-fought title of champions of Europe is impossible to say, but let's take a look at how they're each coming into the match as the "grand finale" approaches. This Real Madrid vs Atletico Madrid kicks off at 19:45 (local time in Lisbon; GMT+1 timezone) and you can watch the game live on Sky Sports 1 in the UK, and on FOX Sports if you're in the United States. Under normal circumstances, if the Spanish League crown comes down to the very last round, and the match to determine the winner is at the Camp Nou between defending champions FC Barcelona and Atletico Madrid, then that would be the biggest game of Spanish football for that season. But this has not been a normal season for La Liga. It's been full of upset, excitement, disappointment, surprise and all kinds of ups and downs. Back in February, long after many had assumed Atletico would have already fallen out of the title race, Diego Simeone's men simultaneously ended Barcelona's streak of 59 straight weeks atop of the league and ended their own club's 18 year long absence from the top spot. However, given the heart, strength and character that Atletico had shown all season, particularly in their numerous previous encounters with Barcelona in La Liga, the Spanish Super Cup and in the Champions League quarterfinals (which Atletico knocked Barça out of), victory had the faint appearance of inevitably about it. After six encounters overall, Barcelona had 5 draws and 1 loss to Atletico this season. One of those draws saw Barça lose the Spanish League title, and the 1 loss saw them eliminated from the Champions League. 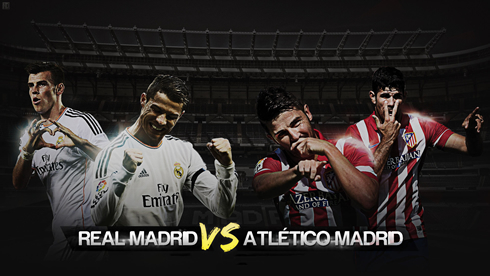 The only thing that stands between Atletico and European glory is one final match against Real Madrid. In May of last year, the two teams met in a very tense, sometimes nasty Copa Del Rey final. Both teams received multiple yellow cards, and eventually, as the game went into extra time, Real Madrid's star winger Cristiano Ronaldo was shown a red card, joined a little later by Atletico's midfielder Gabi. But Atletico managed to win the game and the trophy 1-2 at the Santiago Bernabéu stadium. It seemed like the culmination of a lot of hard work by their manager Diego Simeone, but with his prized striker Radamel Falcao set to leave the club that summer, not many saw the squad as an enduring threat. 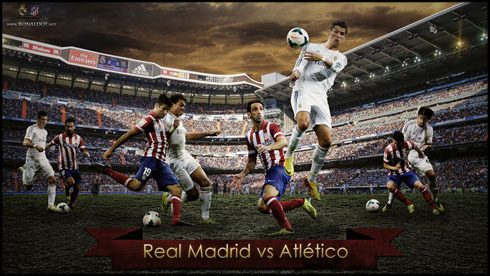 Then in September, in their first encounter of this season, Atletico managed to defeat Real Madrid again. Falcao's old partner Diego Costa was now the golden boy for Simeone's attack, paired with newly arrived Spanish veteran David Villa. Gifted midfielders Koke and Arda Turan were supplying the two. It was evident during the start of the season that Real Madrid were missing their own anchoring midfielder Xabi Alonso, and in his absence due to injury they were finding it difficult under the new management of Carlo Ancelotti to gel as a team. Atletico is one of the few top teams in Europe this season that did not have a change in management or major alterations to the squad before the season started, and this proved to have helped them immensely as they exhibited brilliant teamwork while many other teams struggled to get off the ground. But by the next encounter between the two Madrid teams in February, Real Madrid had found their way. 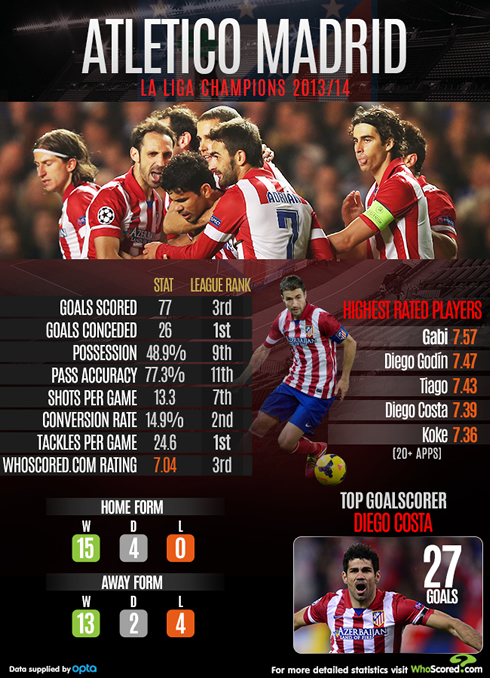 Real Madrid has met Atletico Madrid three times since the loss in September, and they have responded admirably. First, they were victorious over Atletico with an impressive 5-0 on aggregate from their two Copa Del Rey matches, and then a 2-2 draw in their second league encounter. Real Madrid went on to beat Barcelona in the final of the Copa Del Rey when, in the closing minutes, newly arrived Gareth Bale scored what will surely remain one of his most beloved individual goals. The Welshman earned his keep by receiving the ball at the halfway line, then darting both the ball and himself speedily past defender Marc Bartra to net the game-winning goal, earning the Merengues' first silverware of the season. Only a week prior, Atletico had eliminated Barcelona from the Champions League. Between the two Madrid teams they ensured that Barcelona would not win a major trophy this season for the first time in six years. Towards the final few months of La Liga, none of the top three teams could string together enough decisive wins to give them breathing room at the top. When one of the top three contenders dropped points, the other two seemed to follow suit either the same week or the following one. At one point, in round 36 of La Liga, all three top teams dropped points in the same weekend, which had not occurred in quite some time. No one doubts Real Madrid's true passion this season is for "La Decima". During the course of their UEFA Champions League campaign, they've played almost like a different team, a team we've seen glimpses in the shadows of in the Spanish League race, but whose full brilliance and talent has been given a spotlight in the most prestigious competition in Europe. Cristiano Ronaldo broke yet another record: that of most goals in a single Champions League campaign, with 16 so far. In typical Ronaldo fashion, he didn't just break the previously held record of 14 by Lionel Messi, he shattered it by scoring his 15th and 16th goals against none other than the current Champions League title-holders: Bayern Munich. The same Bavarian team that waltzed all over Messi's FC Barcelona last season and went on to win the final, and the same Bayern Munich now being managed by Barcelona's former player and most successful manager, Pep Guardiola. Ronaldo did all of this while also finishing the highest goal scorer in La Liga with 31 goals, earning him the Pichichi award, and tying him with Liverpool striker Luis Suarez as the highest goal scorer in any European league, for which they will share the Golden Boot. If Ronaldo can put on one last dazzling display this season in the Estádio da Luz in Lisbon, Portugal, then he has a very good chance of lifting Real Madrid's long-awaited tenth European title (La Décima) in his home country. The last time Ronaldo performed at Estádio da Luz was 10 years ago, when a young Cristiano Ronaldo had fought his way into the Portugal side competing for the 2004 UEFA Euro Cup. The Portuguese prodigy made it to the final with his team, but left the pitch crying as Greece clinched the trophy in a 0-1 defeat. As an even better and more mature player these days, he will be hoping to erase that memory from the stadium's air with an historic victory. Sadly, it's uncertain after such a long, battling season whether everyone will be fit for the final on May 24th. Ronaldo has been experiencing a muscle strain in his leg lately and was left out as a precaution of the Real Madrid squad that defeated Barcelona's cross-town rivals Espanyol 3-1 on the final day of La Liga, at the same time that Barça failed to defeat Real's cross-town rivals Atletico. However, with the match against Barça being a title-decider, Simeone had to gamble with his fatigued star Diego Costa, who has been dealing with a hamstring injury. Early in the match against the Blaugrana, Costa's injury resurfaced, and while doctors' analysis indicate he should not be ready to play, Simeone has not ruled him out yet. Another huge blow during the match came when a freak collision saw Arda Turan have to be pulled from the pitch. The list of integral players potentially missing from the Champions League final goes on, with Real Madrid's key midfielder Xabi Alonso being the only definite miss due to suspension. Karim Benzema and Pepe are also struggling to be fit for the Merengues. Seasoned veterans for Real Madrid such as Angel di María, Luka Modrić, Sergio Ramos and Iker Casillas are going to have to remain calm and be at their best in order to take on the titans of Atletico Madrid such as David Villa, Koke, Filipe Luís and Thibaut Courtois. With Ronaldo returning to the Estádio da Luz ten years after suffering defeat there in defense of his country, in his first Champions League final in a Real Madrid shirt, fighting for "La Decima" in his home country, the striker in his prime has written what, up to now, seems almost destined to be a story for the history books. But if there's any club this season who has shown a spirited disregard for the histories of others, a club filled with dedicated, team-oriented, foolhardy players desperate to continue writing successes into their own new and exciting history, it's Atletico Madrid. These circumstances and more make for the three most enticing words that can be said about a match of this magnitude: It's anybody's game! Cristiano Ronaldo's next game for Real Madrid will be against their closest rivals Atletico Madrid, in the UEFA Champions League final, scheduled for this Saturday, May 24. You can watch Juventus live stream, Real Madrid vs Atletico Madrid, Spain vs Bolivia, Derby County vs QPR, and Miami Heat vs Indiana Pacers, all matches provided from our soccer live section.